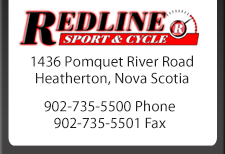 Redline Sport & Cycle is the place for the outdoor machine enthusiast in Eastern Nova Scotia! Owner and lifelong outdoor enthusiast Dale Stewart is ready to help you find the perfect machine for your outdoor adventures – whether its the newest Yamaha model or a classic of yesterday. An experienced on-site mechanic, a full line of safety equipment, access to brand name and third party parts, and a showroom bursting with the latest and best that Yamaha has to offer – Redline Sport & Cycle has it all for the person who enjoys the outdoors. We also are proud to carry Husqvarna products. Stop by and see our showroom and talk to our friendly and knowledgeable staff today!